Marcio Stambowsky, also known as Macarrão, is a Judo brown belt and a Brazilian Jiu Jitsu coral belt (7th degree), who is one of the famous 5 men to have been graded as a black belts by the legendary Rolls Gracie, mentioned as the “Famous Five”. Stambowsky, who was one of the top competitors of in the 1980’s, is also the father of a prolific grappling competitor, Neiman Gracie Stambowsky. Nickname: Macarrão derives from macaroni, the italian pasta type, though in Brazilian Portuguese it is used as a generic term often meaning “spaghetti”. The name comes from Marcio’s surfing days, prior to jiu jitsu and in reality it was his older brother’s nickname, it was only because Marcio was always next to his brother that the nickname became associated with him as well. Stambowsky is also often called “Macarra” which is short for Macarrão. Marcio Stambowsky was born on February 22, 1959 in Rio de Janeiro – Brazil. 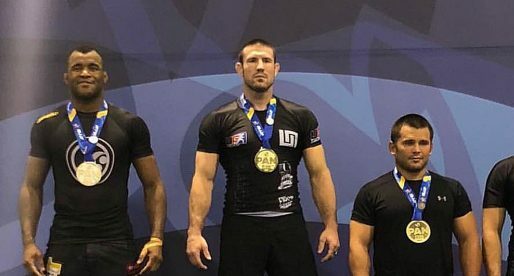 He started doing Jiu Jitsu influenced by Mauricio Gomes, his closest childhood friend who was training at the time with Master Joao Alberto Barreto and convinced Marcio to start training as well. With Jiu Jitsu in mind Macarrão sought his father for advice, and although his dad did not do Jiu Jitsu, he knew about the Gracie family name, taking the young Stambowsky to Rolls Gracie‘s academy. Marcio was so well received by Rolls that he signed up immediately, the year was 1975. In 3 months his best friend Gomes left the Barreto academy as Master Joao Alberto was pursuing a different career. Maurício then joined Rolls Gracie’s gym as well and the two friends became team mates. Roll’s academy was one of the most impressive Jiu Jitsu hubs in the world during the 1970’s, and Marcio shared the mats daily with future legends of the sport such as Romero Cavalcanti, Fabio Santos, Rickson, Carlinhos & Royler Gracie among many others. The gym also had the added advantage of also sharing the building with Carlson Gracie and his team where he met and befriended other BJJ figures such as Fernando Pinduka. In 1978, however, the two academies (Rolls and Carlson’s) would split and work as rival teams in competitions, although still sharing the same premises. A strange chemistry that seemed to work for the two Gracie brothers. By influence of his mentor, Rolls Gracie, Marcio Stambowsky competed in different sports and did not stick to Jiu Jitsu, practising freestyle wrestling, judo and sambo, competing as hard and often as he could. In 1980 Stambowsky participated in a wrestling team that Rolls Gracie intended to take to the Olympic Games in Moscow. The team consisted in several Gracie Jiu Jitsu and Judo fighters from the Gama Filho university. Although the team had the support of the government, on the day of the national trials there was a big fight between the opposing sides and the financial support fell through due to the bad image they had displayed. Also in 1980, Marcio Stambowsky was part of another team that was meant to go to the Sambo Pan American Championship in the United States. The team (again) had many students of Rolls, but in the end they lacked the support to take everyone to the tournament, and although Macarrão trained hard to be in the team he had to stay behind with less the a handful of Gracie’s jumping on the plane. 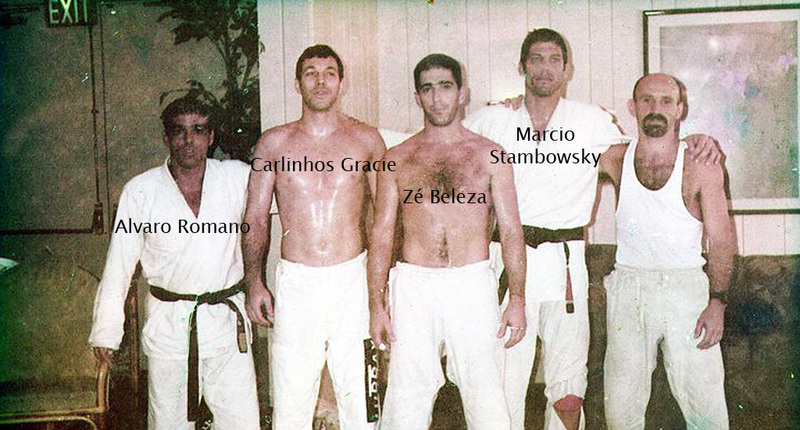 Another interesting episode in Marcio Stambowsky’s life occured in 1981, shortly after he received his black belt. It came as a result of a very famous and talked about fight between Sergio Penha and Rickson Gracie. Rickson met Penha at a Rio de Janeiro tournament in the semi finals of the open weight division. Sergio gave the Gracie the match of his life and was winning by a big margin of points when, moments before the end, Rickson managed to sink a choke on Penha, forcing the tap. On the other side of the bracket was Marcio who defeated every opponent on his way to the final of the tournament. In the final an exhausted Rickson chose to give the final a miss (advised by his father Helio Gracie) due to fatigue, conceding the victory to Stambowsky. Keeping a close contact with the Gracie family, Marcio Stambowsky ended marrying Carla Gracie, daughter of Robson Gracie, from which he had a son, Neiman Gracie Stambowsky and Deborah Gracie Stambowsky. After the death of his instructor and friend, Rolls Gracie, in a tragic accident in 1982, Marcio gave up Jiu Jitsu for an extended period to grieve the loss of his Master and friend. This was a period when Marcio became interested in Judo, competing often for the ‘Club Hebraica’ (a Jewish community club), including in the 1985 Maccabiah Games (an international Jewish multi-sport event held quadrennially in Israel) where Stambowsky won a bronze medal. He also competed at the Maccabiah Pan American tournament. Upon this extended period training mainly Judo, Stambowsky continued his Master’s legacy, teaching his style of BJJ. In 2007 Marcio Stambowsky and his son Neiman moved to the United States where they established their own academy, continuing the work started in Brazil. Hello! Just a small correction: he is married to Carlos Gracie’s Grand daughter, Not the daughter.. Yes, he is married to Carla Gracie who is sister to Renzo, not Rolls. She would be Rolls' niece. Her father is Robson Gracie. Yes, indeed. My apologies, there's 3 Carla's in the family. Got them all mixed up. What was his competition record? O cara da direita do lado do Macarrão é o mestre Manoel tavares, aluno do Grande Mestre Hélio e do Relson. Foi formador de diversas feras, a mais famosa creio que seja o bi campeão mundial Daniel Moraes. Vale um artigo!